CLEVELAND — Knicks coach David Fizdale may need the upcoming All-Star break to go someplace warm and reorganize his thoughts. Ten days before the Kristaps Porzingis blockbuster, Fizdale had stretched the boundaries when he said the 7-foot-3 Latvian had been “really engaged’’ with his team. Either he exaggerated the truth or misread Porzingis. Now the first-year Knicks coach has planted another seed for his revisionist-history tree. He said Monday morning here the Knicks “stuck to the plan’’ by trading Porzingis. You can knock or praise the Porzingis haul, but you can’t pretend the franchise was not building around its injured bedrock. The franchise was attempting to net Porzingis another star piece in the lottery or free agency this summer. Now Porzingis is waiting in the wings in Texas. But Fizdale, whom the Knicks media adore for his charisma, finally went too far at Monday’s shootaround. 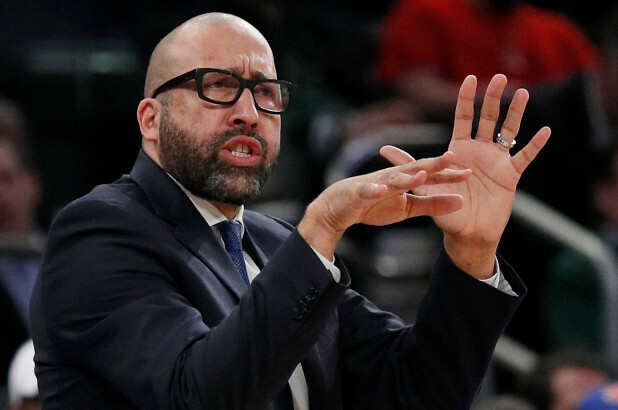 “We have a plan,’’ Fizdale said when asked about the losing getting to him before his 10-46 squad lost 107-104 to the Cavaliers. “If I would’ve come into this thing thinking one thing and now all of a sudden it’s this? But no, I came into it expecting the worst. And preparing myself for the absolute worst.